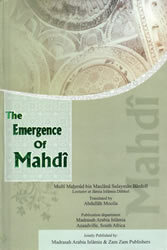 In this work, Mufti Mahmud Bardoli presents the summary of extensive research that deals exclusively with authentic information detailed in the prophetic traditions concerning the emergance of al-Mahdi. He clarifies common misconceptions that abound regarding al-Mahdi. This work has been lent credence by senior scholars such as Mufti Ahmad Khanpuri and Shaykh Abu Bakr Ghazipuri. The author, Mufti Mahmud bin Maulana Sulayman Bardoli, is a lecturer at Jamia Islamia Dabhel (India).